taming Kalhatti. My tired legs pushed away from the blanket and I managed to get out of bed. The floor below my feet was cold and leaving the coziness and warmth seemed like a tedious task. I walked toward the window and to my surprise, I could barely get a glimpse, beyond a couple of meters. For a moment, the Elk hotel appeared to be situated in a massive foggy cloud. I wondered how cold the water would be and just looking at the weather it wasn’t hard at all to get the answer. From toothpaste oozing out of the tube, the hot shower turning cold was a task I had to settle before heading out. It definitely looked like the Sun had taken an off from his usual routine. The cyclists, the bikers and the other support crew including me were all layered in clothes which were a fail after an hour. The weather forced the organizers to make a few shifts with the flag off timing as the conditions remained unchanged. After killing some time we all headed out in the cold as everyone started feeling the frosty glitch. An inhospitable cold freezer showered with an early dawn drizzle made it even harder to stay glued to the bike. Getting out of the city with the noisy traffic tested our patience as the markings on the road were almost a blur. It didn’t take long for the strong riders to breakaway and head towards support station 1 and then further ahead. It seemed they had their own plan in their minds processed onto the pedal. 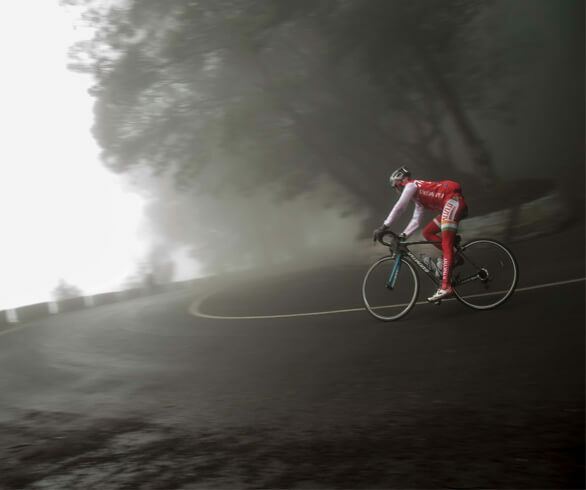 In the meanwhile, the unkind cold had started taking a toll on the cyclists as the groups started to break as everyone scattered over the climb heading towards kodanad viewpoint. As the riders cruised downhill their numb hands had to deal with the bike, handling and braking with the uninvited chills shooting through their spine. As we toured in our car with the heater on, we bumped into a bunch of cyclists at support station 1 situated 24km away from the start point. While the cold bothered most of them, there were a few who couldn’t care less, the cold was no obstacle. They went on to cracking some funny jokes. They even dropped in their views on whether to head back to the hotel or simply ride ahead without attempting to get to compete. With the weather forecast flashing a bitter 13 degrees the soggy attire of the cyclist made it even worse. The foggy sheet spread over the scenic view remained a mystery with the only indicator being the aroma of fresh tea fields which weren’t noticeable at that moment. Even the RAY photographers had a hard time focusing their lens with shaky hands. With time, this unpleasant chill started taking a toll on the volunteers and the bikers who patrolled between support stations with supplies. At the same time, the lead peloton were all stopped at support station 2 as the organizers waited for clear skies. The organizers were forced to put an end to the ride because of safety concerns. While a few thought it was a smart choice, several others insisted that the organizers change their minds. But the growing cold along with the breeze and the zero visibility didn’t seem to be an idea that was worth the gamble. The organizers being kind enough offered the riders an option to ride back to the hotel or be transported by a sweep truck. Surprisingly, many of them chose to ride back home on granny gears in spite of unchanged weather. Several of them halted to have pasta which was already on its way from the hotel, while others carried on with their journey. This was a clear indicator to us that the previous days Kalhatti climb did shake many off the riders, but not completely break them. spent chatting and chilling and recovering before we began on another journey called Day 4. To view more pictures of the day kindly click here. Also, read fellow cyclists and official blogger Venkateswara Rao Navanasi’s blog on his Day 3 experience.